I've never seen so many birds there and they were all angry at me for waking their babies and leading away the mosquitoes they were hoping to eat. I was eaten alive slowly because I was also hauling around 100 pounds of water in my over-topped boots. Worst of all, once I got out to BRU02 the well I was looking to put a data logger in was gone! The only reason I walked all the way out there during prime bug season was to leave that data logger and some jag had pulled my monitoring well out of the ground. This unusual flooding pattern ruined my day and I couldn’t even capture it for analysis. Three trips later the well was reinstalled with a data logger and the data gathered there is what I’ll cover in this post. Spoiler alert: in all my data analysis I haven’t been able to predict what shoes you should wear to the marsh, so bring them all and select according to the volume of water you’re comfortable hauling around. Pro tip 1: always wear a long-sleeved shirt. 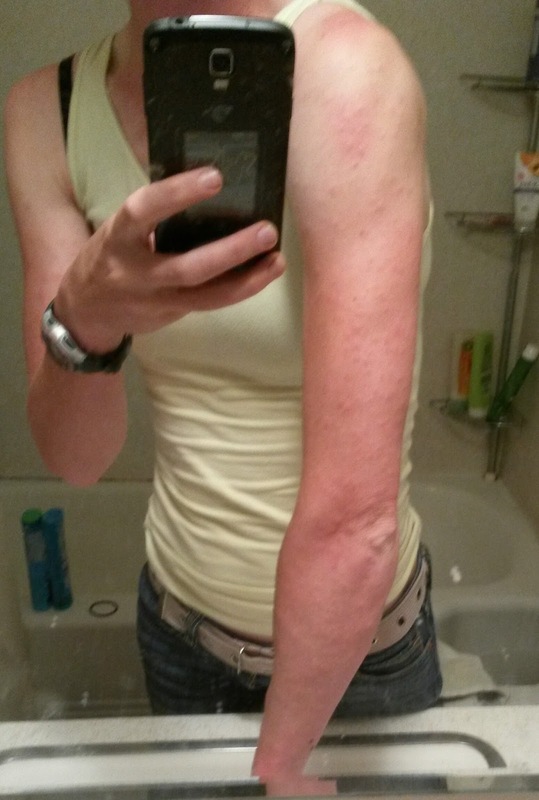 Mosquitoes don't care about the DEET bath you took if you are the biggest source of blood around. Pro tip 2: always go into buggy places with someone bigger (i.e., chum). I’ve tied myself in knots over my 2nd dissertation chapter worrying about whether I gathered enough of the right data and figuring out how to display it. 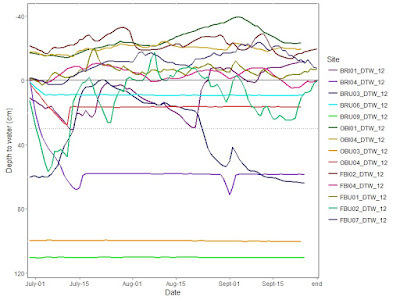 Every time I look at the data I decide I should just go gather is all over again, then I remember that terrible day. Thankfully, a do-over is not an option. The data I gathered are super cool, though adding the keyword ‘super cool’ to a publication probably won’t really sell it, so I’ll be working through some ideas here. A strictly hydrological study would measure each of those arrows and require a lot of instruments: evaporation pans, transpiration sensors, a nest of piezometers to measure water depth and movement to shallow and deep aquifers, and flow gauges where water comes into and out of the wetland. Fun stuff, for sure, but costly and inappropriate for answering my ecological question. 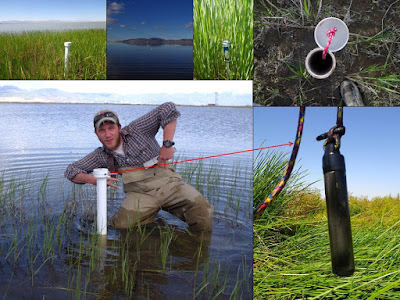 If you’ll recall, my goal is to figure out the impact of impoundment on Great Salt Lake wetland condition (i.e., are we doing a good thing managing water the way we do?). 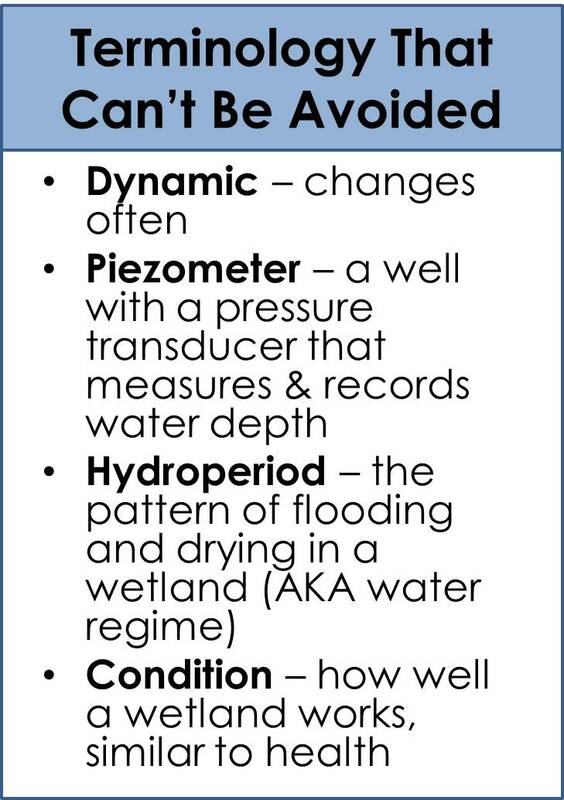 To answer that question I need to look at the aspects of hydrology that impact vegetation because the vegetation tells me what condition my wetland is in. I’ve been really worried about defending my focus on water depth when I could have measured so many other things. In ecology we face a trade-off sometimes between measuring all the possible variables at one place or measuring a few well-selected things at a whole bunch of places. I’ve chosen the latter option – measuring one of those hydrology arrows above at 50 places. Measuring water depth from May to September proved a solid idea because it’s the aspect of hydrology most relevant to the plants . 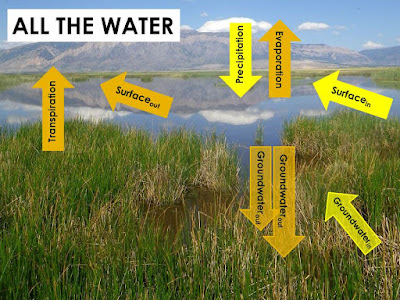 Even better, water depth is one variable that reflects changes to water coming in and leaving wetlands (all the arrows) - it integrates all the aspects of hydrologic change. What?!?! Is there a pattern hidden in there? What parts of that four month period matter most? 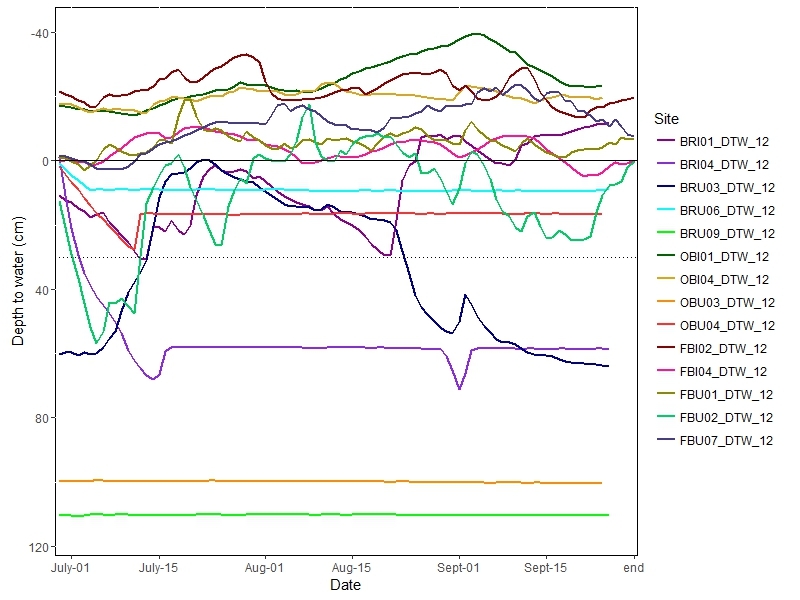 It was confusing and cool and great justification for investing in piezometers for each site! A piezometer is a well with holes or slots drilled into the bottom so that it fills as water tables rise. Many piezometers are equipped with data loggers called pressure transducers that measure the weight of the water in the well and translate that to a water depth. The water depth measurement is recorded every hour and stored in the pressure transducers. I felt pretty clever in some of my calculations because I had a breakthrough with for-loops, but the results were...urm… TBD. To answer Question 1: Great Salt Lake emergent wetland hydroperiods are semi-permanent: water is deepest in the late spring, driest in mid-summer, and flooded again in the fall. 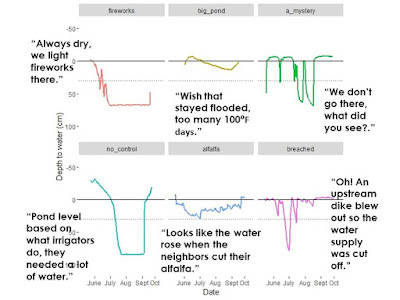 But there is a lot of variability, from temporary to permanent flooding. Combining the hydroperiod information with the condition data I gathered to answer Question 2 is more interesting. Getting reference condition (the healthiest) wetlands requires a relatively narrow set of hydrologic conditions: average water depth over the whole growing season should between 5 cm deep and 10 cm below the surface and wetlands should be saturated or shallowly flooded in late summer. The water should be drawn down a little, but that low point shouldn’t fall below the reach of plant roots and only last a couple weeks. 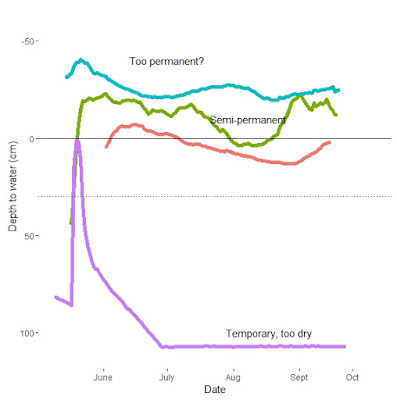 While the zone of optimal conditions is narrow, periodic deviation from that hydroperiod, like during a dry year, won’t disrupt wetland condition. Instead, many years of dry conditions or constant flooding are what hurt the condition. And all that variability I saw – well, there are a whole bunch of ways to be in non-reference condition: too wet, too dry, too flashy, too stable….One big caveat – unimpounded wetlands were significantly drier than impounded wetlands and in significantly lower condition – these things are inextricably linked. 1. Logging the data – as long as you select the correct date for automated pressure transducers to start gathering info, things are stress free. Batteries remained ~70% full after 3-4 years. Taking pressure transducers out during the winter gave some piece of mind, but did miss a potentially important window between the thaw and beginning of spring runoff. a. I used In-Situ Rugged TROLL 100 pressure transducers (cost ~ $400) and installed 3 Rugged Baro-TROLL 100 barometers approximately 20 miles away. Pressure transducers started recording 12-18 hours after they were deployed in the field. Pressure transducers were deployed in May and gathered in September so I could upload data and check batteries and skip gathering unusable ice data. I measured water depth at the well when pressure transducers were deployed and during any field visits; these measurements were used to post-correct and validate data. All data was uploaded using Win-Situ 5.0 software, corrections for barometric pressure were made with the BaroMerge function and then with actual water depth data using the Post Correction function. 2. Piezometer pieces – Wells were 5-feet long in total, the top 4 feet was 2-inch diameter SCH-40 PVC, the bottom foot was 2-inch diameter 0.10 slotted environmental PVC (you can get it from drilling supply companies); sections were glued together with a PVC coupling. I glued a fitted cap to the bottom and drilled a ¼ inch drain hole. I used 3-inch diameter slip caps, stainless steel eyelet bolts, and four-feet of paracord to suspend pressure transducers. Caps were secured with 8-inch plastic zip ties. The caps and rope, while cheap and easy, were suboptimal. 3. Installation – easier than expected, kind of. We used a 3-inch auger to install wells to a depth of 3 feet (not possible with dense clays, caliche layers, oolitic sand, or deep water); wells protruded about 2 feet from the ground. I recommend installing wells deeper if a wetland is very dry or if there are cows. We placed wells in the deepest flooded area that had dense, emergent vegetation; the deepest point was thought to be most representative and the vegetation would prevent tampering. 4. Troubles – it was difficult to find 2-inch PVC in dense Phragmites and hardstem bulrush (handheld GPS units have an accuracy of 3-5 meters). Keep in touch with land managers or hidden wells may be burned, bent by an ATV, or mowed over. Cows are always itchy and will scratch on the sturdiest thing around, just build little fences around them because that scratching will displace pressure transducers and mess up your data. US Environmental Protection Agency. 2008. 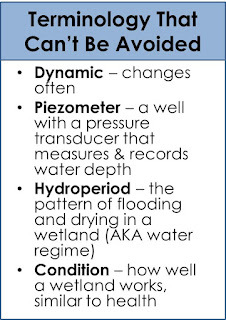 Methods for Evaluating Wetland Condition #20: Wetland Hydrology. Prepared jointly by the U.S. EPA Health and Ecological Criteria Division and Wetlands Division. Brown, S. C., Smith, K., & Batzer, D. (1997). Macroinvertebrate responses to wetland restoration in northern New York. Environmental Entomology, 26(5), 1016-1024.